From the M5 at Exeter take the A30 road driving approximately 70 miles, bypassing Bodmin and at the Victoria Interchange take the B3274 and follow signs for Withiel. Once on the Withiel road travel through the first crossroads and turn left at the second crossroads and the Lanjew Farm entrance is first on the right. Lanjew Park is situated on your left down the farm drive. 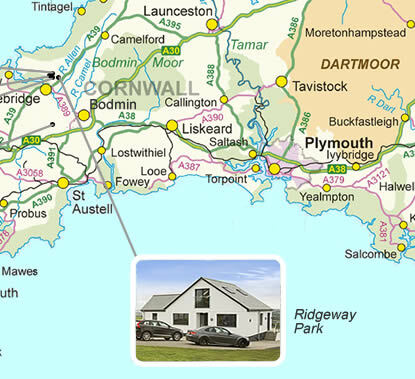 We are just 2 miles from the main A30 road. From the M5 at Exeter take the A30 via Okehampton and Bodmin by-pass. At Kennards House turn left on A395, when it joins the A39, fork left and follow A39 through Camelford towards Wadebridge. After passing the St Kew Highway Service Station on your right, take the third turning right to Chapel Amble. At T' junction turn right for Chapel Amble village. 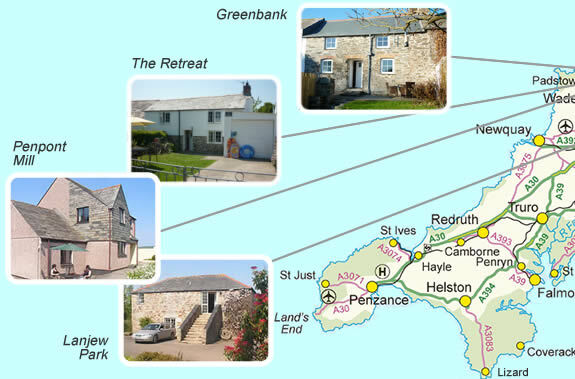 The Retreat is the second property on the left as you drive through the village. From the M5 at Exeter take the A30 via Okehampton and Bodmin by-pass. At Kennards House turn left on A395, when it joins the A39, fork left and follow A39 through Camelford towards Wadebridge. After passing the St Kew Highway Service Station on your right, take the third turning right to Chapel Amble. At 'T' junction turn right for Chapel Amble village. Greenbank is the second property on the right as you drive through the village. From the M5 at Exeter take the A30 via Okehampton and Bodmin by-pass. At Kennards House turn left on A395, when it joins the A39, fork left and follow A39 through Camelford towards Wadebridge. After passing the St Kew Highway Service Station on your right, take the third turning right to Chapel Amble. Ridgeway Park is situated just down this road on the left. Chapel Amble village is 1.5 miles from here, turning right at next 'T' junction will take you into the village. From the M5 at Exeter take the A30 via Okehampton and Bodmin by-pass. At Kennards House turn left on A395, when it joins the A39, fork left and follow A39 through Camelford towards Wadebridge. After passing the St Kew Highway Service Station on your right, take the third turning right to Chapel Amble. At next 'T' junction Penpont Mill is situated directly opposite. Turning right will take you to Chapel Amble village, 1 mile away.